View cart “Hot Wheels VW Volkswagen MK2 Custom Painted Flat Black” has been added to your cart. 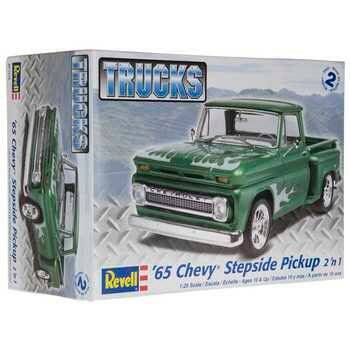 Build a classic with 1965 Chevy Stepside Pickup 2 ‘n 1 Model Kit. This kit contains the pieces you need to construct a vintage pickup truck. The original ’65 Chevy Stepside is capable of standing out at car shows and is capable of carrying heavy loads. This kit features a details 283 V-8 engine with optional engine parts and disc brakes. Recommended for ages 10 and older. Glue and paint are required (not included).